Whereas with Chromecast you need a computer or iOS or Android device to stream content to and control it, Roku’s device is similar to its more conventional ‘streaming players’ on which apps can be installed but in a more convenient form, though it comes with some Chromecast-like functionality. Resembling a rather chunky USB flash drive it can output 1080p video, passthrough 7.1 and 5.1 surround sound and has built-in 802.11 dual-band Wi-fi support. There’s no Ethernet connector, but it has a micro-USB port which, like Chromecast enables it to be powered via a USB port on your TV or the mains (a cable and USB adapter are included). The accompanying remote uses Wi-fi Direct so no ‘line of sight’ is required (useful if you have the dongle hidden away around the back of your TV) and is much like other Roku remotes with its quirky console-like design. It has few buttons, but it’s still very usable when it comes to navigating menus or playing content for which it has play/pause and fast forward and rewind buttons. It doesn’t, however, have motion control functionality for gaming like the Roku 3 controller. The setup procedure is straight forward including connecting it to your network. You’re given a ‘link code’ for the dongle to be entered into the Roku website on which you must create an account, which can be used to pay for content. The simple user interface is just like that found on Roku’s streaming players and can be customised with themes and screensavers. Installed apps can be displayed in a desired order and given a star rating. Apps can be downloaded to the dongle from a Channel Store and, certainly compared to Chromecast, support is extensive with BBC iPlayer, BBC News, BBC Sport, ITV Player, 4oD, Demand 5, YouTube, Netfl ix, Sky Store, Now TV, Facebook, Spotify, Picasa and Flickr among the lineup. You can also obtain apps for a diverse, international mix of ‘internet TV’ and on-demand channels. Other apps such as Crackle, Rdio, Vevo and TuneIn also off er video, music or online radio streaming and you can download games such as Jeopardy and more screensavers. Some, such as a Roku Media Player and Plex, can be used to stream media from networked sources. The latter is particularly good making excellent use of metadata and able to play many file formats. We successfully streamed content from our computer with Windows 7 and Plex Media Server installed. You can also use a SlingPlayer app to stream from a Slingbox. Unavailable from the Channel Store at time of review, however, were Amazon Instant Video, Wuaki.tv or a web browser. Like Chromecast you can use Netflix and YouTube’s mobile apps to ‘cast’ content (from the internet) to the dongle. Unlike it, there’s no (Chrome) web browser mirroring from computers, but Roku plans to introduce a way of casting content from a computer to a TV “over time”. 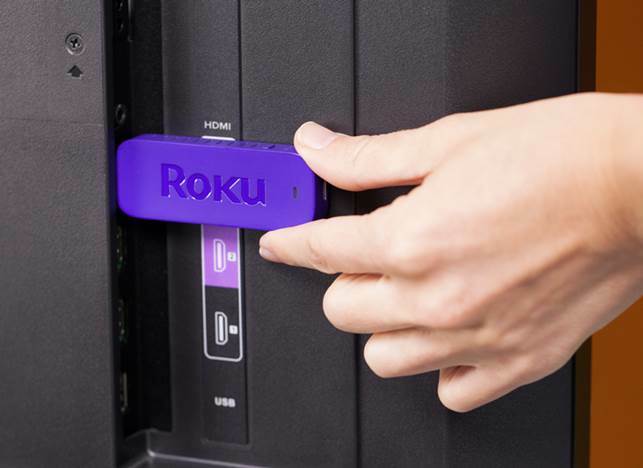 A free Roku app for compatible iOS (including iPhone, iPad and iPod Touch) and Android devices can be used as a remote control, to browse and add channels and stream media stored on your device to the dongle. An app for Windows 8/8.1 phones and Windows 8.1 devices can also act as a remote control. Performance-wise, video from some less-well known sources looked decidedly ropey on our TV, but good quality video including HD content from Netfl ix and BBC iPlayer streamed smoothly and looked great. The price is about right for a product that currently has more to off er than Chromecast or indeed the also comparatively limited and pricier Apple TV. If you’re after a versatile ‘plug and play’ multimedia upgrade for your TV, it’s pretty much a no-brainer.